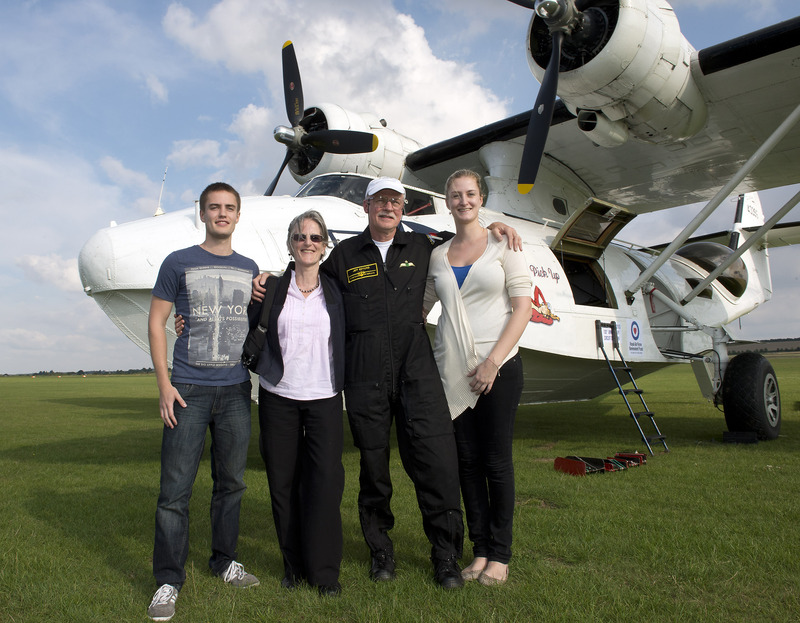 The crew stayed overnight with Wing Commander Phil Lamb and his family. Batteries recharged after a restful night and an excellent breakfast, the crew headed back to the aircraft driven by the Station Commander himself. Crew Chief David Legg supervised refuelling prior to the crowds rolling up to the Classic Air Force so as to see inside a special visitor, “Miss Pick Up”. They were an interested lot with plenty of questions for the crew. It was amazing how the time whizzed by and soon it was time for the pilots to strap in and start going through checklists. Before doing so Wing Commander Lamb and his family as well as Flt Lt Spencer were thanked for their hospitality. Departing at 1300 it was a case of keeping to schedule. Jeff flew the departure and started a climb to port so as to run down the coast to Lands End flying at 700 feet. After that waypoint and turning west it was a case of heading for the only Control Point of the sector. 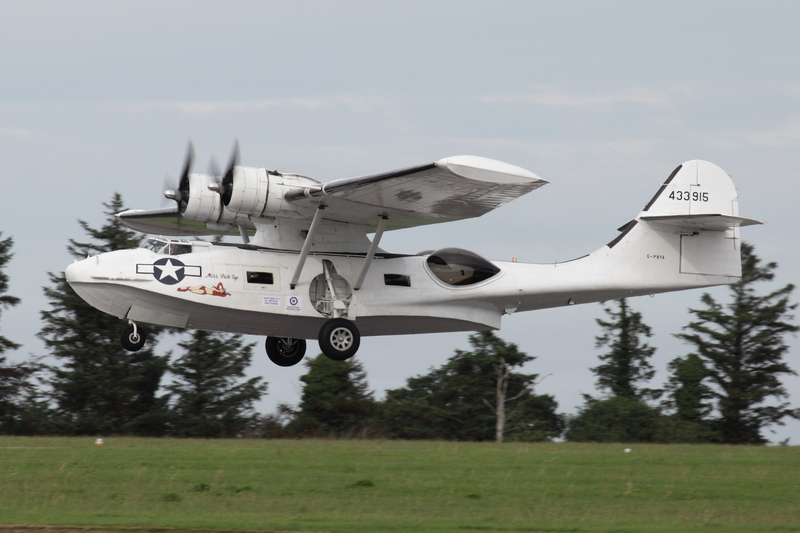 The two Harry’s did not get the chance to land at Falmouth but the Catalina Crew were keen to put on a good display. Display completed it was back to the coastal journey past Dawlish and Poole. Weather conditions had changed by this time and the crew were dealing with a 20 knot headwind and mixed weather. John’s skills as a navigator quickly analysed the situation and the throttles were pushed forward to maintain ground speed. 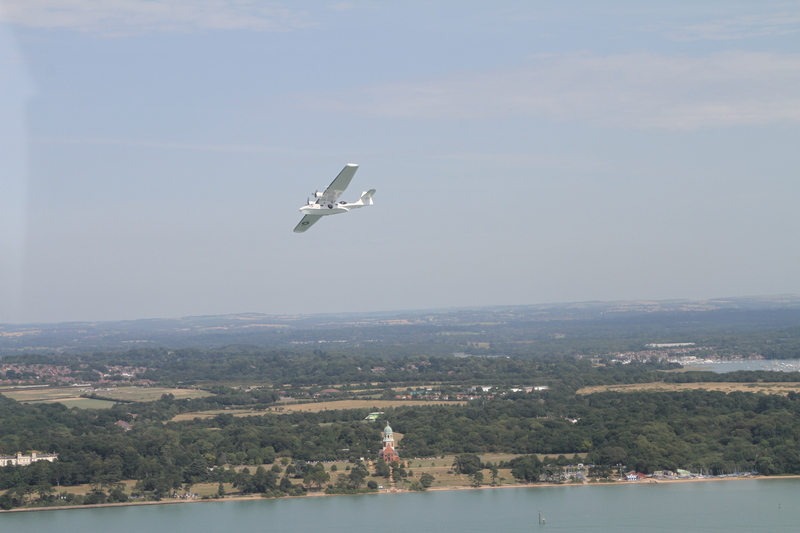 The headlands around Poole were covered in patchy cloud but the Catalina was able to fly along the shoreline of Poole Harbour, well known for its flying boat history. Shortly afterwards and despite the haze, a camera ship flown by Jon Butts and with Karl Drage behind the camera came alongside. It was planned to do some more air to air shots as the Catalina flew past the Needles and the southern coastline of the Isle of Wight before heading up Southampton Water. By this stage Solent Radar and then Southampton ATC were providing a very helpful service to both aircraft. The original finish line was at Netley on Southampton Water and an orbit was flown. It was felt that the Circuit of Britain had now been completed albeit 100 years after the attempt by Harry Hawker and his mechanic Harry Kauper in the Sopwith Waterplane. However, there were still some tasks to be completed by the crew before arrival back at Duxford. First, Southampton requested a flypast which was done. The next priority was entering the London TMA on time. By this stage John was flying while Jeff navigated and spoke with Heathrow Special. Remember, John’s PTT radio switch was still broken! 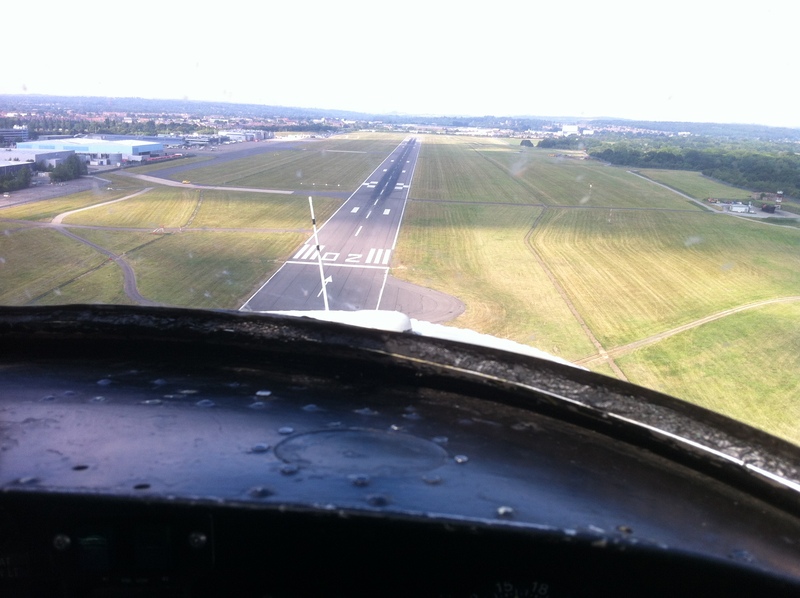 Cleared to enter Class A Airspace at Brooklands, the Catalina then turned on to an easterly heading. From there it was clear to see that Heathrow was on easterly departures meaning there was a known airspace conflict with the standard instrument departures flown by Heathrow traffic. Would Heathrow Special grant permission for the flight at 1000 feet over Hook and Kingston? Yes! Passing Hook floats were lowered for Hawker and the watching crowd at St Pauls Church, his last resting place. Next a turn to starboard onto an easterly heading. It was obvious that NATS had come up trumps with a “Check All” as the 70 year old Catalina banked over the Sopwith building in Kingston. Continuing on, the Catalina climbed to be above 1400 feet. Even so G-PBYA still passed below the top of the Shard and then flew over Tower Bridge. Heading north over the Lea Valley towards Brookmans Park VOR brought the home straight into view. John passed control back to Jeff for the short flight back to Duxford. After a smooth landing the welcome from the crowd was overwhelming. Five days and over 1800 nautical miles later it was a case of “mission completed” for the Project Hawker 2013 crew. It was all smiles for pilots John Warman and Jeff Boyling ably supported by Crew Chief David Legg. Standing either side of David were the welcome ground crew party of Baz Stead and Crew Chief Shaun Jarvis. On reflection, it was absolutely fabulous to have completed the Circuit of Britain Race 100 years after the attempt by a fellow Aussie, Harry Hawker, the man who gave his name to aviation. It would not have been possible without the help of many along the way. A special thank you to the following: CAA, NATS, Esther Blaine (IWM Duxford), Mike Neville and his RAFBF team, RAF Leeming, RAF Lossiemouth, RAF St Mawgan, the flight and ground crew of G-PBYA “Miss Pick up” and all those who sponsored the flight. An extra special thank you to the close support team of Jeff’s wife Liz, daughter Emma and son Alex. 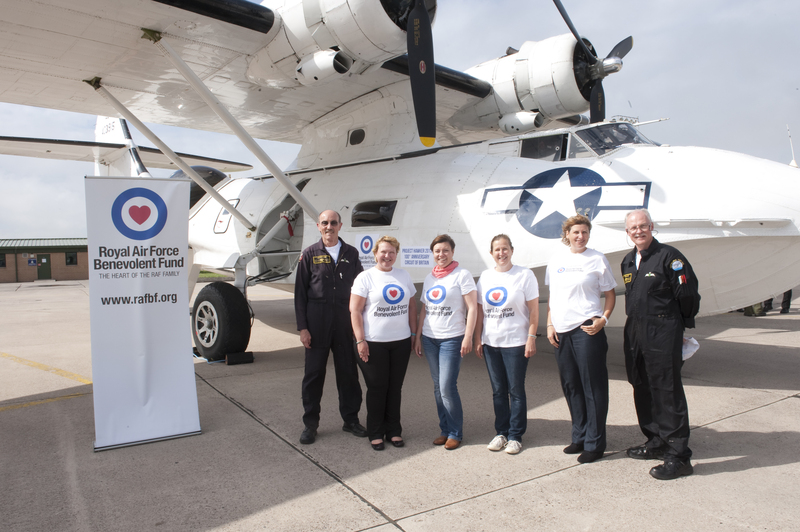 The RAFBF and IWM Duxford were the chosen charities and fundraising increased their reserves. 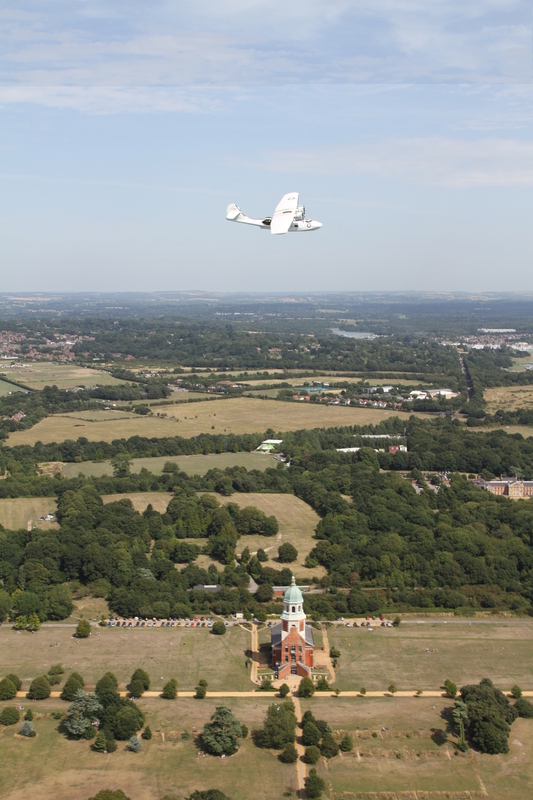 To read more about this historic flight, the 1913 attempt and support the charities go to www.projecthawker2013.com . Another but not the last interview for Jeff! Day 4. Saturday 24th August 2013. Sector 2. 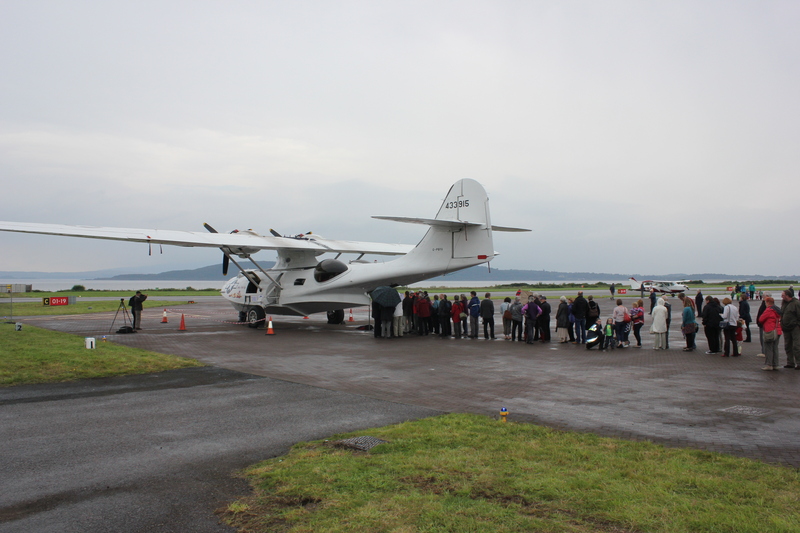 Greetings, photos and thank you’s completed, the Catalina departed heading back to the coast and then it flew south to Rosslare. The departure was far from normal with a helicopter orbiting beside the threshold and Se Pardy flying the Maule aircraft waiting for an air to air photo shoot of the departure to the coast. The latter was part of the Dublin Flightfest preparation to be held the following month. Turning south again it was on to Newquay / RAF St Mawgan and the Classic Air Force. First a few danger areas had to be negotiated and the good news was they were inactive thanks to it being a weekend. 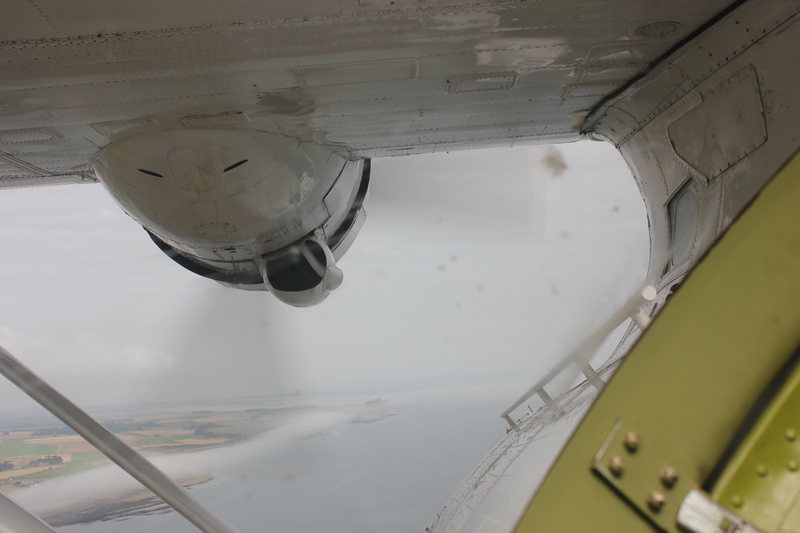 The Catalina flew just to the west of Lundy Island before reaching the coast near Bude. It was then another coastal flight down past Tintagel prior to landing at Newquay Cornwall Airport. Once parked on the apron outside the Classic Air Force hangar it was a case of stretching the legs before getting down to business. 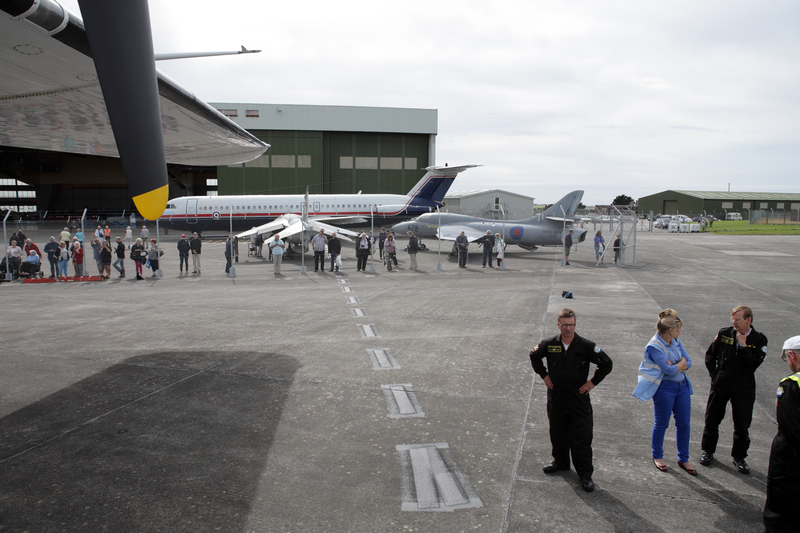 There was a crowd on hand to welcome Crew Chief David Legg, Captain John Warman and Co-Pilot Jeff Boyling. John’s wife Dilly was also on the scene which was great. John had served on Shackletons and Nimrods during his service career and he had been based at RAF St Mawgan. For John and Dilly, it was a trip down memory lane. Next it was a case of taking on board the invited guests of whom there were seven. 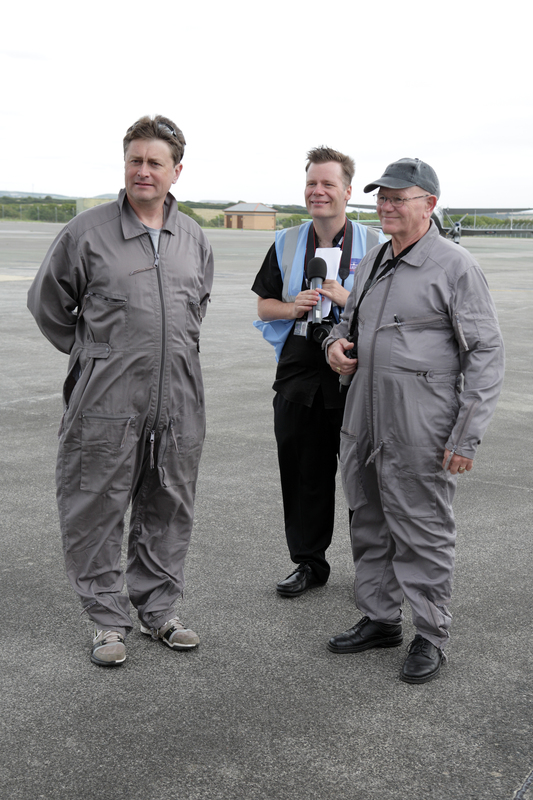 There was the Radio Cornwall presenter plus a guest from Newquay Cornwall Airport as well as the Classic Air Force, all kitted out for their flight. 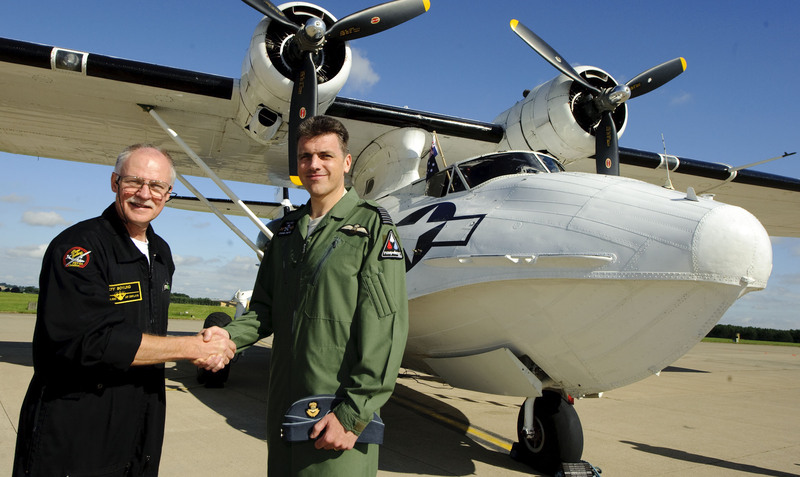 Top Cadet Sam Davies, Wing Commander Lamb (RAF St Mawgan Station Commander) and Flt Lt Spencer (Station Media & Communications Officer) chat with Jeff and John prior to boarding the Catalina for the local flight. There followed a short flight down the coast past Perranporth and back to Newquay. Also on board was a local man from Quintrell Downs, Squadron Leader WH ‘Spud’ Taylor DFC, a veteran of Lancasters, Shackletons and Nimrods – all operating from RAF St Mawgan – The Cornish Base. Spud was born in 1920 and joined the RAF just before WW2 in 1938. His RAF service was completed in 1975 and he carried out a remarkable 59 operations with Bomber Command on Wellington, Stirling and Lancaster aircraft. He was awarded the DFC in 1944 and was mentioned in dispatches in both 1948 and 1952. With his family awaiting his return, the smile on the face of Sqd Ldr Spud Taylor DFC (93 years young) after his local flight said it all! The day was not yet over. Flt Lt Spencer had a minibus on hand to convey the crew and all their kit to the Station Commanders quarters but on the way there was a wreath to lay. The journey to the memorial went past the Shackleton Gate Guardian at RAF St Mawgan. With the Padre on hand along with service personnel and cadets duty was then done. Wreaths were laid by Wing Commander Lamb and Project Hawker 2013 Organiser Jeff Boyling at the memorial to Flt Lt Gareth Nicholas, a local chap, lost in the Nimrod Crash in Afghanistan. The crew were staying at the Station Commanders residence. Naturally, each room had an aviation theme and Jeff’s was no exception. 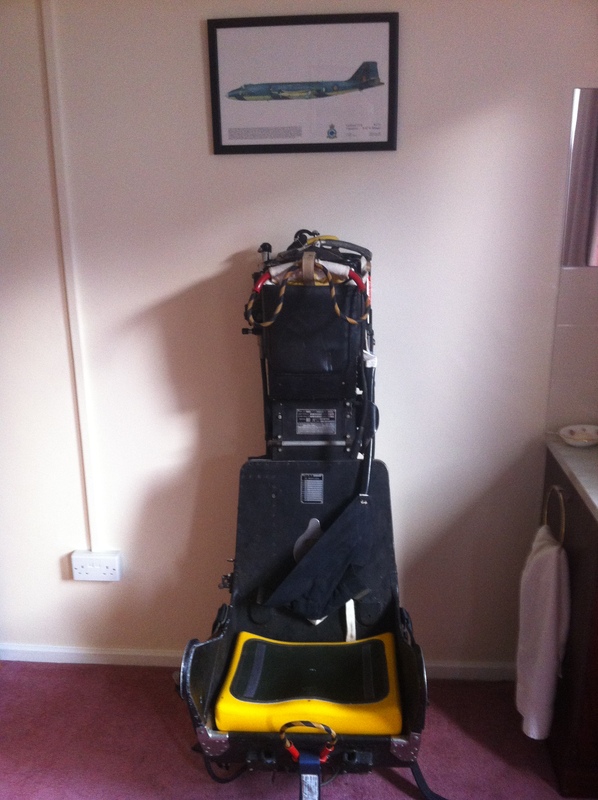 The Martin Baker ejection seat from a Canberra was not tested nor required during the night! That evening the Catalina Crew were guests for a small evening drinks reception and dinner hosted by Wing Commander Lamb. It was a great way to finish another interesting day on the 100th Anniversary Commerative Flight of the 1913 Circuit of Britain Race flown by Harry Hawker and Harry Kauper in a Sopwith Waterplane. The Catalina was enjoying its 70th birthday outing too! 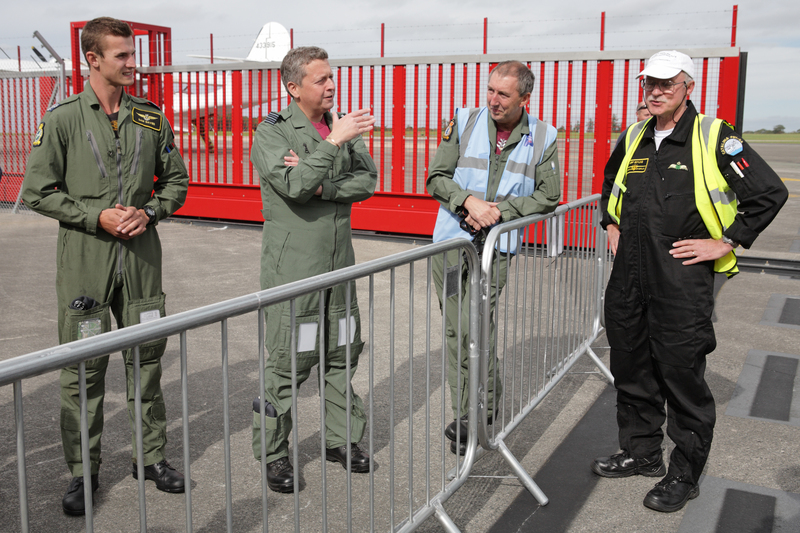 One day left to go and would the Project Hawker 2013 Crew complete its mission? Another post to follow. Chief Engineer Garry Short had driven to Oban overnight arriving in the early hours of the morning. He joined the crew at the Barriemore Hotel for breakfast and Jeff reviewed the plans for the day with the crew and support team. Rod was departing with Jeff’s family to drive back to Inverness for their flight back to London. 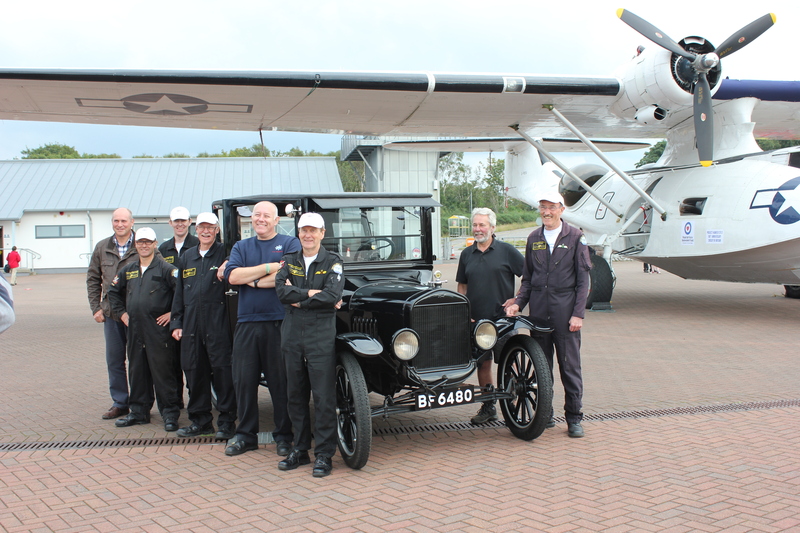 Crew Chief Shaun Jarvis did not join them but instead volunteered to stay with Garry and return with him in the car to Duxford. 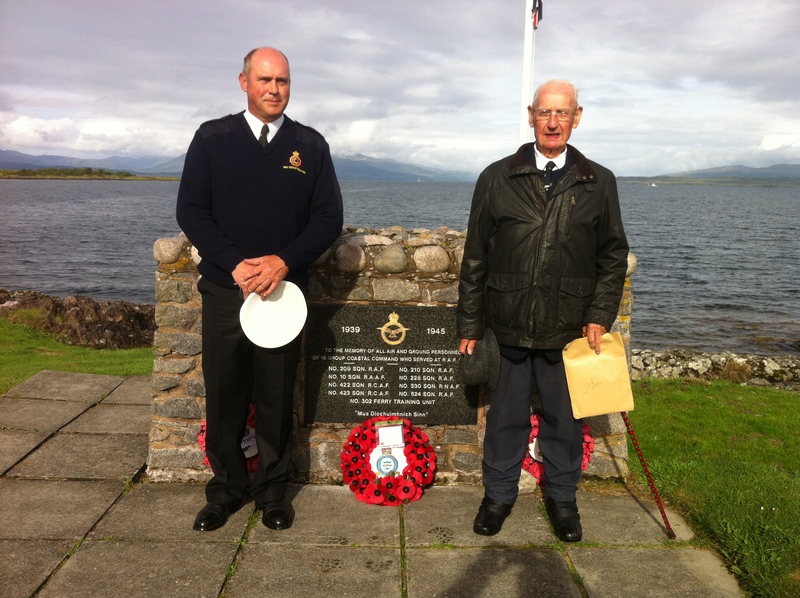 John and David went with them to the Oban Airport while Jeff attended a wreath laying ceremony at the Ganavan RAF Memorial. Wreaths were laid by local Coastal Command veteran Tom Lennox, Neil Owen of HM Coastguard and Jeff who placed a Coastal Command wreath at the memorial on behalf of the Catalina Crew. Neil Owen (HM Coastguard) and Tom Lennox at the RAF Memorial Ganavan. While John and David prepared the aircraft, Garry assisted by Crew Chief Shaun Jarvis soon had the landing gear ram bolt replaced and the paperwork signed off. 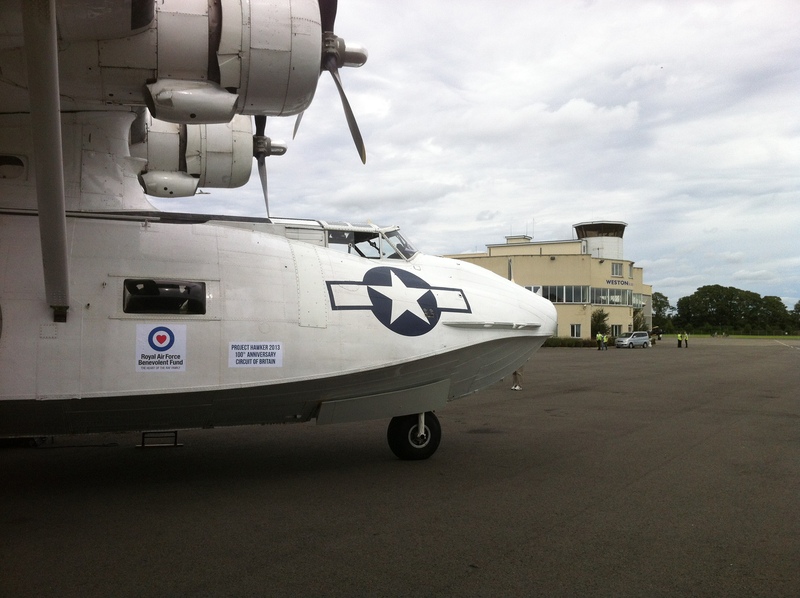 In fact they ensured the Catalina was able to depart Oban on time. But first, the contingent of cadets who attended the wreath laying was able to inspect the Catalina. 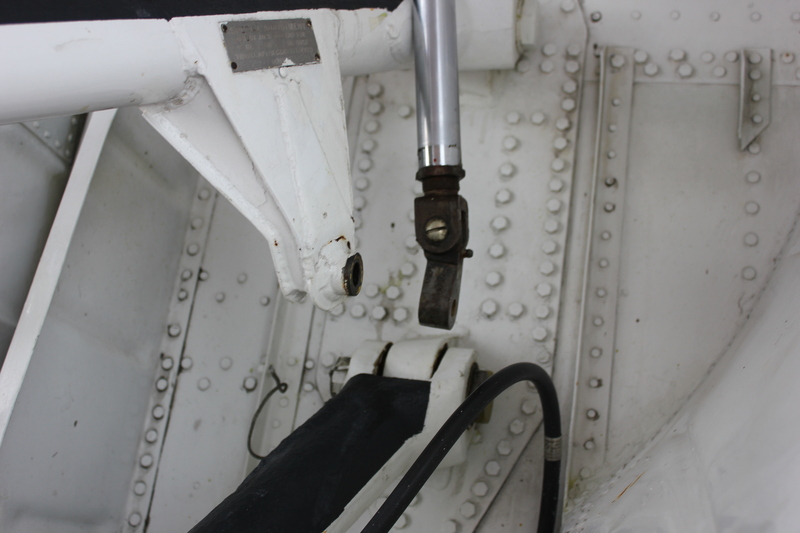 The landing gear ram hanging loose minus the sheared bolt shown below. John flew the initial departure so that the gear could be tested. 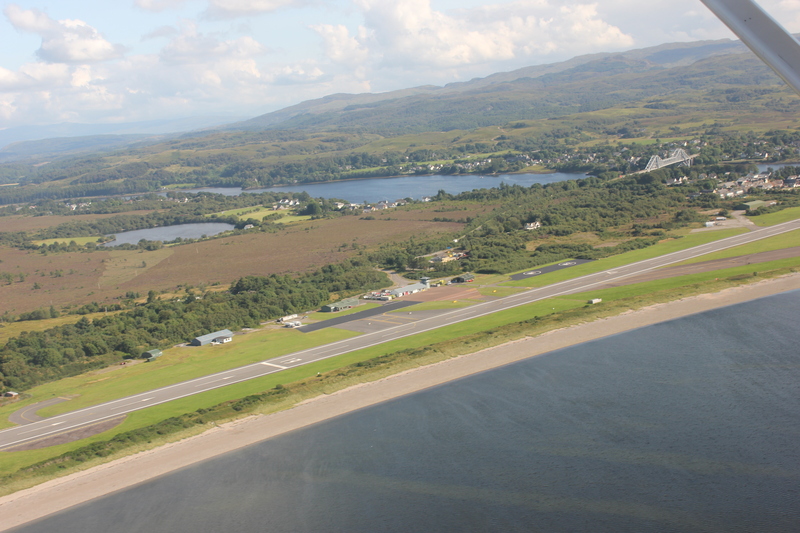 The gear retracted without problem and it was cycled again while undertaking an orbit over Oban Airport. The good news was it definitely worked! Jeff then took control and overflew the local cemetery where floats were lowered to pay respect to Donnie MacFarlane a WOP/AG of 158 Squadron. Donnie had been a stalwart of the local service community and sadly he had died the day before receiving his Bomber Command Clasp. It was a simple task for the Catalina crew to overfly the cemetery but a gesture greatly appreciated by this airman’s family. The two Harry’s had been delayed in 1913 by a flooded float so the efforts of Garry and Shaun were greatly appreciated. Flying conditions were slightly better than the previous day. After the cemetery flypast the Cat dropped down over Oban and departed to the south passing inside Kerrera Island and then west of Jura onwards to North Coast VRP. Turning south it was a case of flying past Kiells where the Sopwith Waterplane had set down for running repairs in 1913. There was a sense of remoteness about the place so it must have been even more isolated 100 years previously. What charts did they have to navigate by or was it a case of an atlas? The Catalina crew had up to date charts backed up by a pair of Garmin GPS units. After Islay it was on to Larne. Hawker had set down here as well but the crew were under some time pressure today so they flew on. Flying at 700 feet and with mountains to the west, it was not surprising that communication with Belfast Radar was not easy. However, communication was eventually established and then lost. 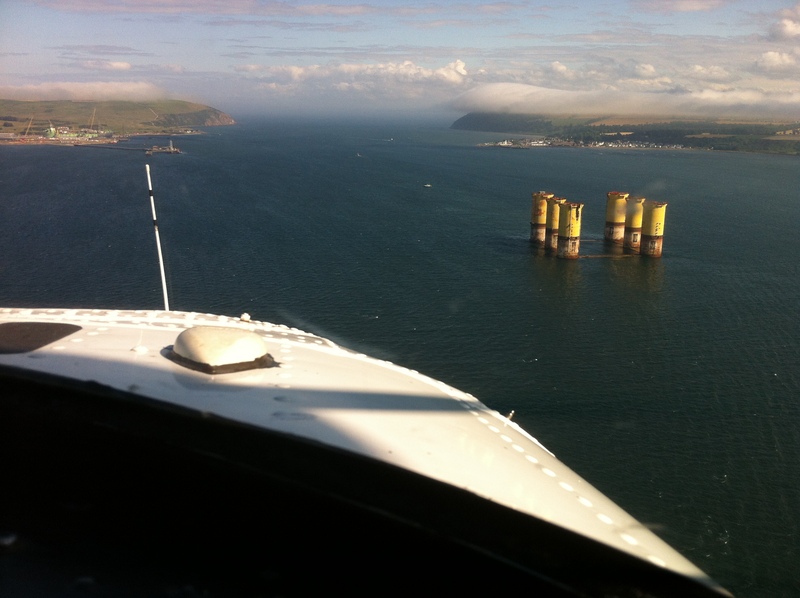 The crew continued their coastal route towards Kilkeel and the Irish Airspace boundary. Contact was established with Dublin Radar and clearance to enter the Class C Airspace granted. It was on to Loughshinny where Hawker and Kauper came to grief in 1913. 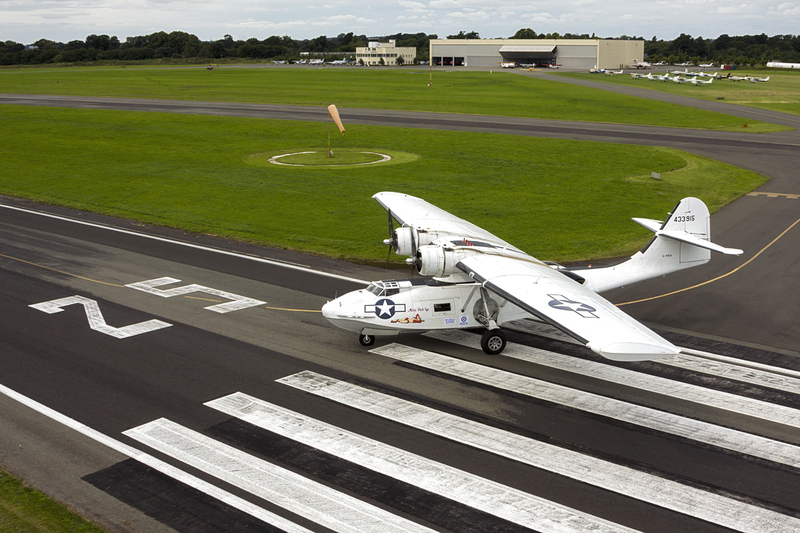 However, the Catalina was not on a re-enactment flight! Jeff flew an orbit over the harbour to the delight of the locals who had their own special celebrations planned for the Sunday. The Catalina then descended below 500 feet so as to remain clear of the traffic on final approach into Dublin. John then took command to perform another air display this time at Dun Laoghaire, the 7th Control Point which sadly the two Harry’s never reached. Hopefully, the crowds at the ferry terminal, marina and the Royal St George Yacht Club appreciated the performance. There was a crowd waiting here and soon the crew and the Catalina were surrounded by photographers. A coffee and a comfort stop for the crew was appreciated. There was still a time pressure to arrive at Newquay / RAF St Mawgan so as to complete the tasks for the day. Sector 2 to follow with Pembroke Dock featured! In 1913 it had taken Harry Hawker and Harry Kauper flying the Sopwith Waterplane two days to reach Oban. They had stopped at five Control Points along the way and Oban was now the sixth. 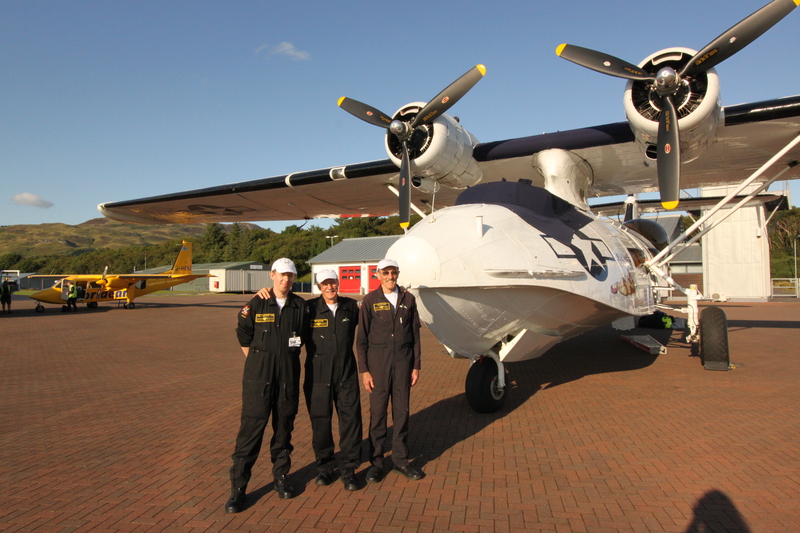 The Catalina G-PBYA had reached Oban and taken two days as well. In that time the Catalina crew had overflown London, landed at Southampton, RAF Leeming and RAF Lossiemouth, undertaken six air displays not to mention a couple of flypasts and a couple of wreath laying ceremonies. It was time for a break! On the Thursday evening the crew dined at EE-Usk, a local seafood restaurant, and celebrated the achievements of the flight so far. On the way to the restaurant they had stopped and admired some of the history on the esplanade. Jeff pointed out the Great Western Hotel which had been the Oban Control Point in 1913 and which was still in existence. A neighbouring hotel had a small photographic display of wartime Oban and of course Catalina’s were a large part of the scene. Also, the Barriemore Hotel had featured in 1913 as a backdrop to the two Harry’s pictured on the floats of the Sopwith Waterplane. The crew awoke on the Friday morning well rested. Breakfast was a full Scottish affair and the staff at the Barriemore Hotel ensured the crew and support team were well prepared for the day. The plan was to conduct an air display in the morning and a local flight at the end of the day after the Catalina had been open for inspection to the public. Alas the weather was not the blue skies of the day before. 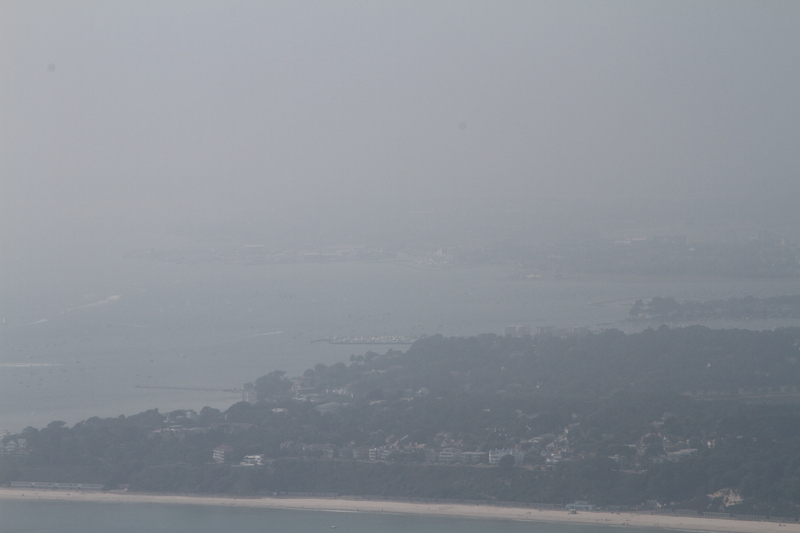 Instead there was low cloud and the distant islands were obscured. Unfortunately, rain was on the way. However, at this stage the conditions were still within display limits. Consequently, the “rest” day in Oban started with an air display over the harbour flown by John Warman with Jeff and David as crew. The approach to the harbour was from the west past McCaig’s Tower. Fortunately, the cruise ship had slipped anchor during the evening and departed for the outer isles much to the relief of Jeff! 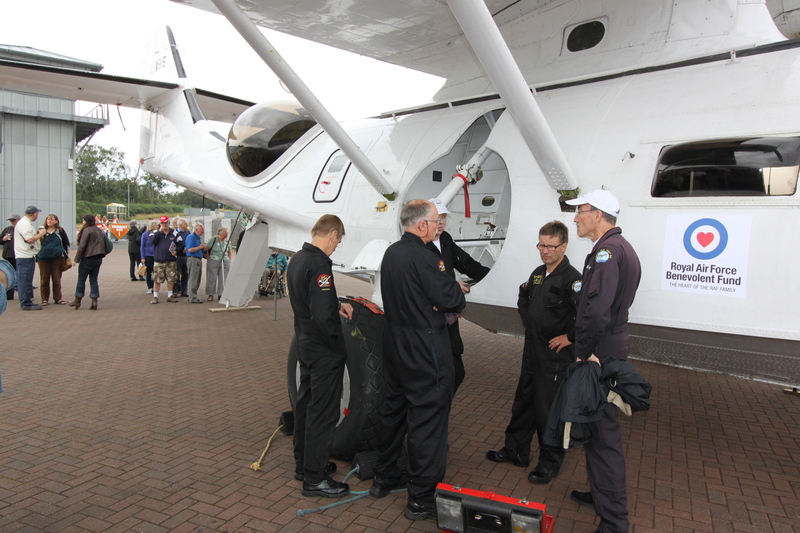 The aircraft was then open for inspection. Given the limited airport parking, a shuttle bus was in operation to bring the locals from the town out to the airfield. Despite the rain they turned up. 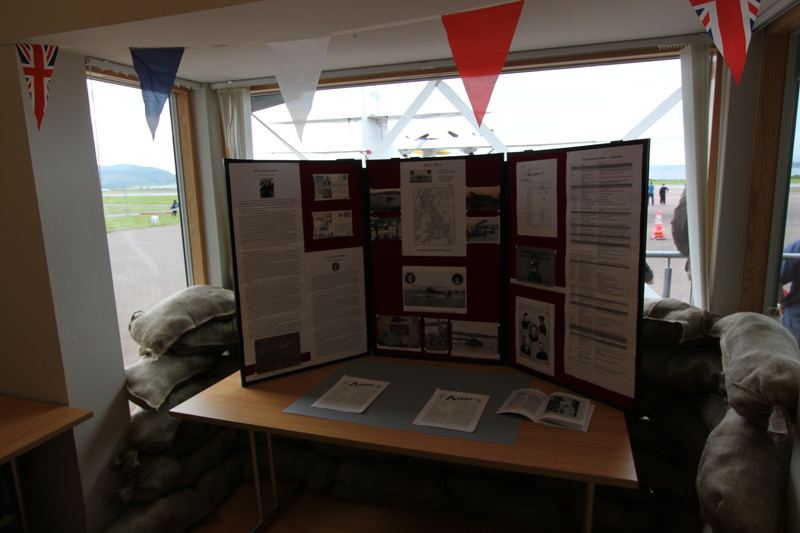 There was a display in the main terminal building and various stands selling goods in the equipment hangar. Jeff had brought along two display boards. One covered the 1913 Circuit of Britain Race and the other provided details of the Catalina G-PBYA, RAF Coastal Command bases in WW2 and the story behind Miss Pick Up. The veterans including Jeff Leech and Tom Lennox rolled up along with many interested spectators. Speaking with the veterans was a great privilege for the crew as they provide that link with the past. For the young ones, perhaps seeing such a historic aircraft will provide the stimulus to follow a career in aviation. One of the eagle eyed spectators queried why the starboard landing gear ram was hanging loose. Alas, a bolt had sheared at some stage after the last landing or whilst taxing in. This meant the Catalina was grounded. Float problems for the two Harry’s had nearly ended their attempt on the Circuit of Britain in 1913. 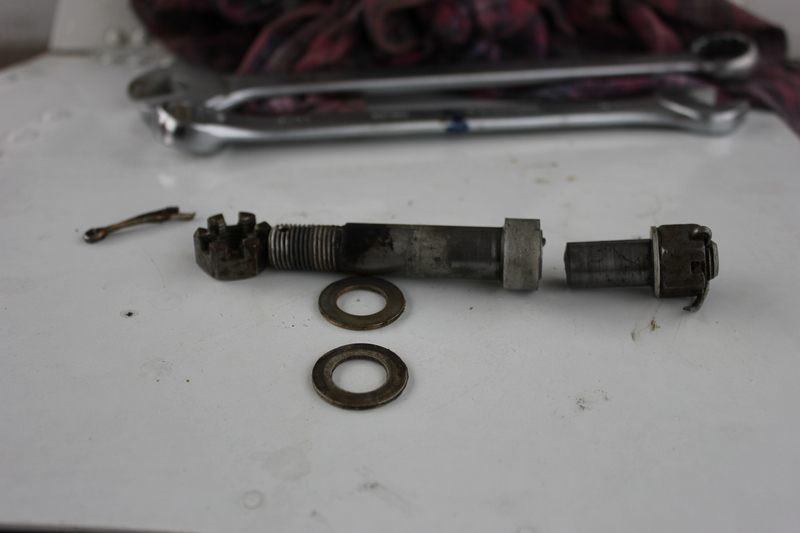 Was this sheared bolt to be the end of Project Hawker 2013? The good news was there were five crew on hand to weigh up the options. A call to Duxford soon had Garry Short, the Chief Engineer for Plane Sailing Air Displays Ltd, driving north overnight with a replacement bolt plus tools. Jeff’s wife Liz organised hotel accommodation for Garry. 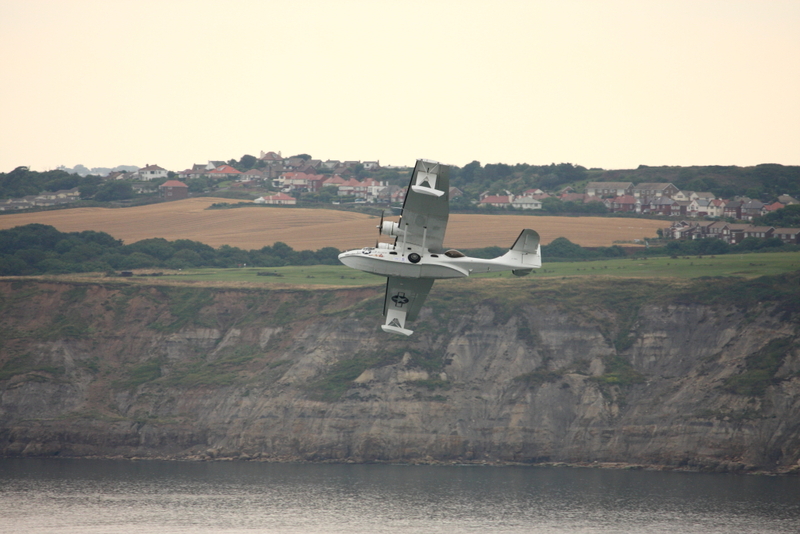 In the meantime the visitors continued to enjoy hearing about the Catalina and what Harry Hawker had attempted in 1913. Despite the problem of the landing gear it was still all smiles in Oban: from the left, Neil Owen (local resident and prime mover for the Catalina visit), Crew Chiefs David Legg and Shaun Jarvis, Jeff Boyling (Project Hawker 2013 Event Organiser), Tom Eddleston (Oban Airport Station Manager), Captain John Warman, Paul Keegan (Total Logistics Concepts i.e. fuel supplier) and finally Captain Rod Brooking on the right. The car was not the crew transport but part of a larger display! At the end of the day the Catalina was secured and the crew retired to the comfort of the hotel. The evening relaxation included a visit to the Oban War and Peace Museum which had kindly stayed open for the crew to inspect. Would the new crew members of John Warman and David Legg have a couple of days flying to deal with? Find out tomorrow! The visit to RAF Lossiemouth was meant to be brief but at least the crew met the local RAFBF Team plus spoke with the Ops staff to ensure the flight would not disrupt any fast jet traffic. With engines started it was a short taxi out but a long hold. A GR4 Tornado had taxied out beforehand and the hump in the runway meant it had disappeared from view. After what seemed like ages it re-appeared and roared past allowing the Catalina to line up and depart in a somewhat slower but more graceful style. Heading west Inverness ATC had requested a flypast but alas due to time pressures and the route it had to be sadly declined. It was then on to Cromarty, another Control Point and a great sight with “haar” on the hills either side of the Firth. 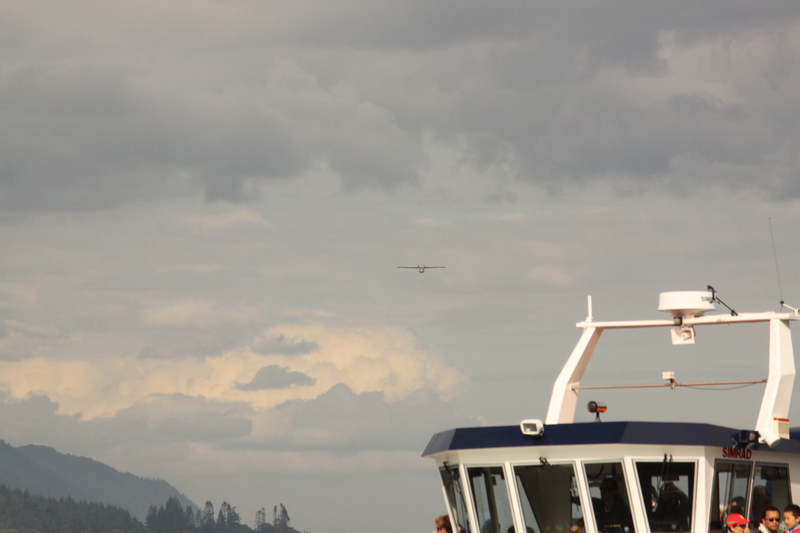 The plan was to fly into the Firth so as to announce the Catalina’s arrival. Jeff did this and continued the few miles on to Invergordon, a former RAF Coastal Command. A quick orbit was flown at Invergordon before turning back to the display area. By this stage Rod had seen the obstacles to avoid. 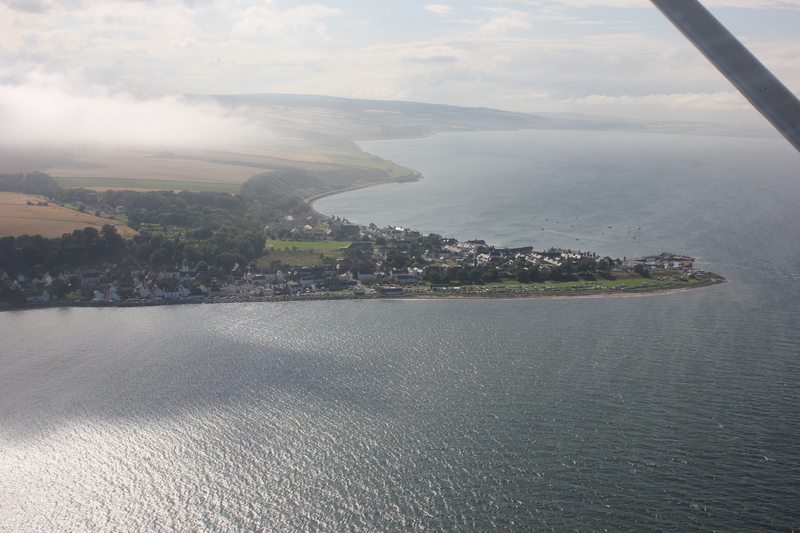 Approaching Cromarty from Invergordon with “haar” on the hills. The former Naval Air Station was only a tent encampment on the grassy foreshore in 1913 but it was now full of onlookers. Sylvia Tarrant from The Highland Council was on the north side of the Firth and you can view her photos of the Display here: http://www.flickr.com/photos/highlandcouncil/sets/72157635192777299/ The crew certainly appreciated the generosity of the Highland Council, Black Isle Ward and the Cromarty Firth Port Authority who had sponsored the display. 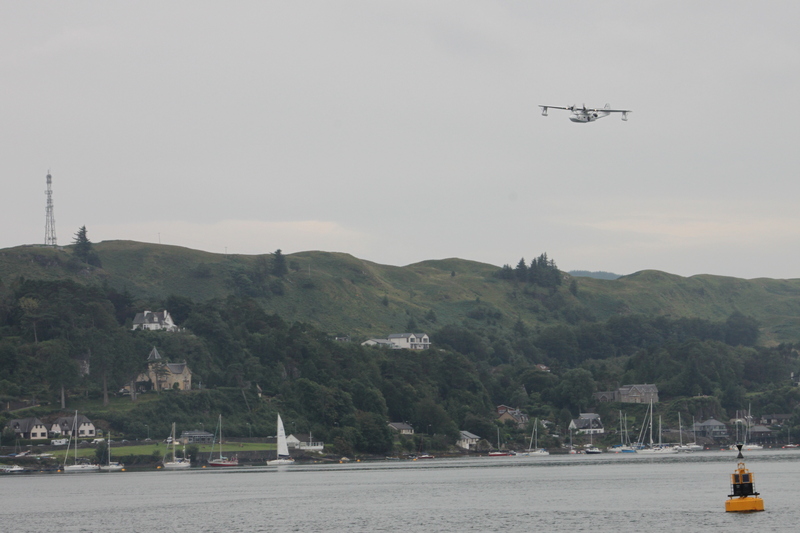 With the air display over it was time to continue on to Oban. The route planned by Jeff took the Catalina back over Invergordon and then the Council Offices in Dingwall before hopefully flying down the Great Glen at low level. The weather on the east coast was no longer to be seen and now there was excellent visibility and a much higher cloud base. A low level passage was definitely possible but the temptation to fly really low was resisted. 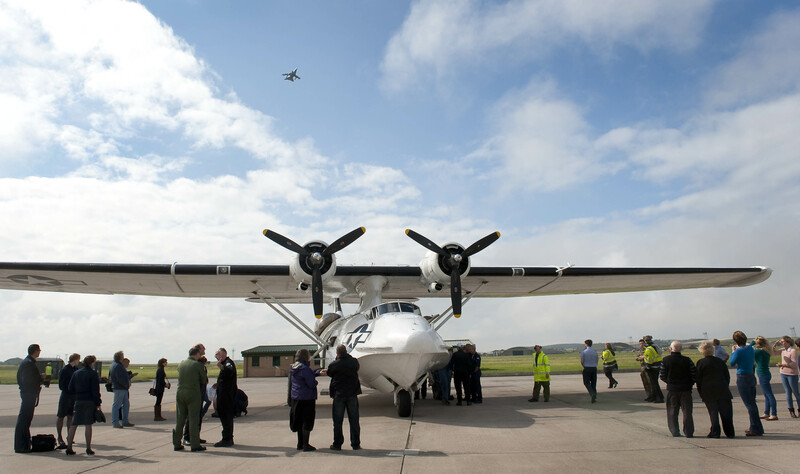 RAF Lossiemouth had stopped any fast jets and those sightseers on scenic launches wondered what was happening as the Catalina flew past, low and slow. Down the Great Glen at 700 feet. Can you see it yet? Its behind you! 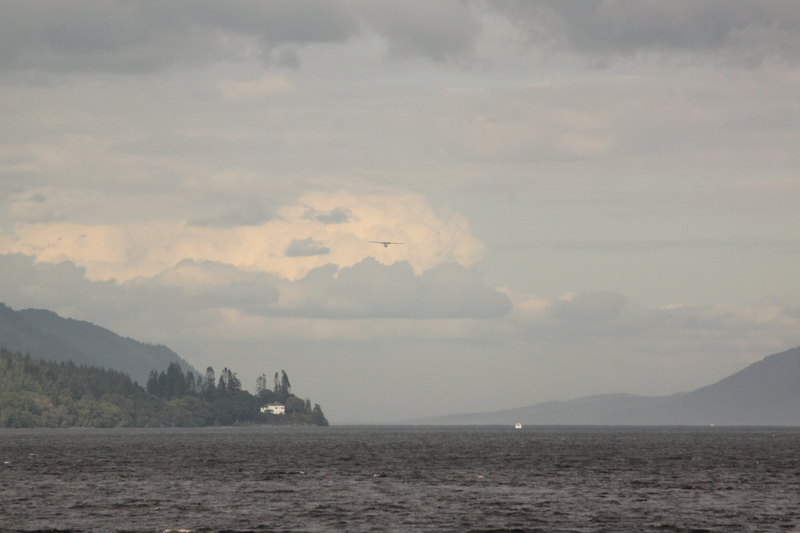 Jeff’s family and John Warman saw this as they waited at Fort Augustus. Due to the tracking device on board the Catalina, John had been able to follow the progress of Project Hawker 2013 and suggested a stop at this vantage point. It was great for the support team (i.e. Jeff’s wife Liz, daughter Emma and son Alex) to see the Catalina fly over. Aloft, it was a truly memorable experience for the crew to have such good weather to fly this sector and in particular down the Great Glen. Emerging from the Great Glen it was then a case of how to proceed? 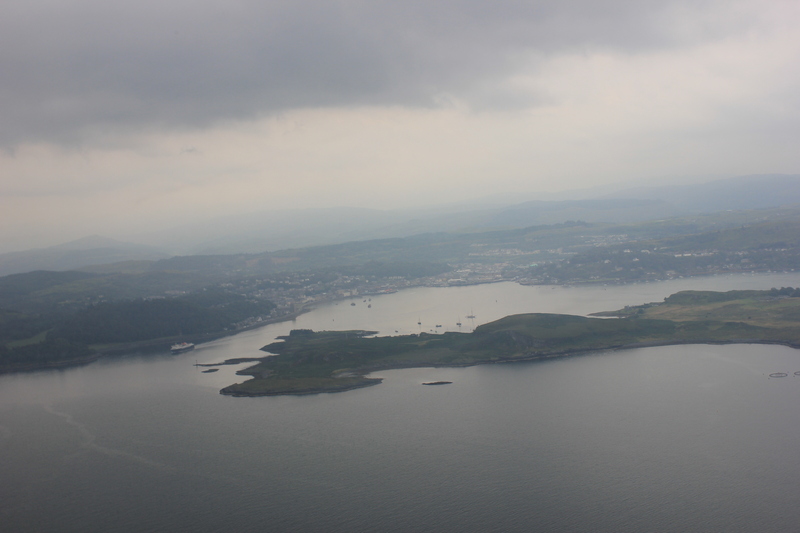 The crew flew over Oban Airport and approached Oban from the North but how was the time going? 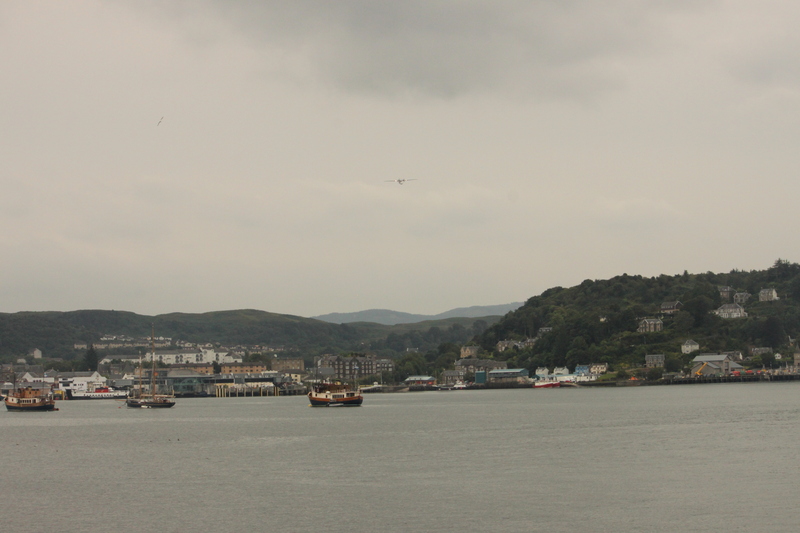 By good planning, Oban was reached in time for the closing of the Highland Games. In fact flying over the Games it was clear to see a pipe band in full swing. However, dropping down over McCaig’s Tower to the harbour gave the crew a surprise. Moored in the harbour was a huge cruise ship. Worse still, it was right in the display area! 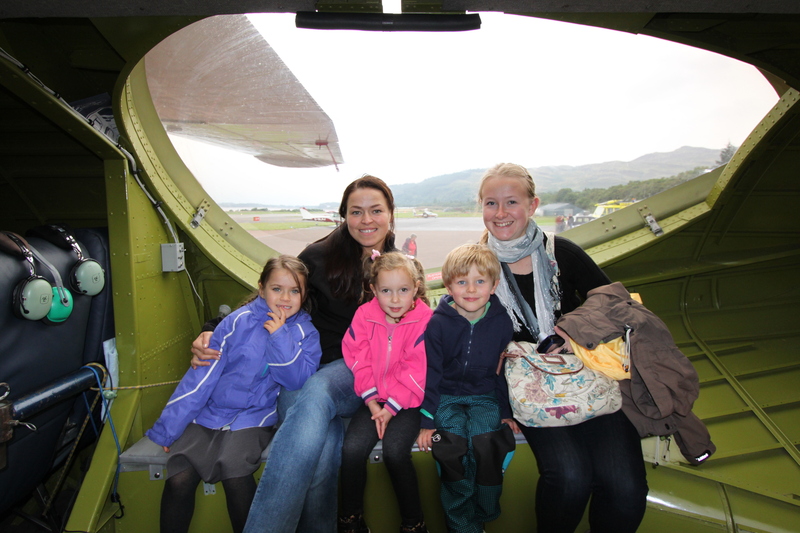 Luckily, the air display was planned for the Friday so the crew flew back to Oban airport. Just as the Catalina flew out of the harbour Jeff was able to point out to Rod and Shaun the crew accommodation. The Barriemore Hotel is at the end of the esplanade and it was easy to see because of the chap in a pink shirt standing outside. Who was it? Once on the ground it was a tight taxi on the apron but there were a number of excellent airport ground staff to protect the Catalina’s 104 foot wingspan. Passengers on the local Hebridean Airways flight must have wondered what was happening. 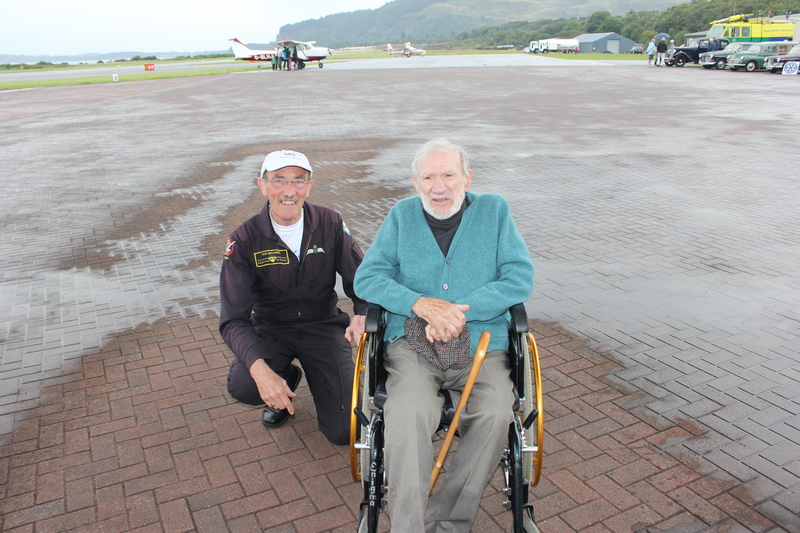 Oban Airport Station Manager, Tom Eddlestone, was on hand to welcome the crew and it was blue skies again. Would it last though? For Captain Rod Brooking and Crew Chief Shaun Jarvis, their flying duties had been successfully completed and they could relax a bit now! Also, Jeff’s family had arrived with Captain John Warman. They had flown into Inverness and then driven down to Oban. Hopefully, Crew Chief David Legg was at the hotel having travelled across from Edinburgh on the train. Two nights were planned for Oban and this permitted a change of Captain and Crew Chief. Project Hawker 2013 was not even halfway at this stage so more days and sectors were to be flown so keep following! The crew slept well and met at breakfast. To be served at table was a treat and the cost of £1.20 each for a full cooked breakfast brought smiles to all concerned. Afterwards Flt Lt Phoebe Rossiter collected the crew and took them back to the aircraft. Crew Chief Shaun Jarvis was soon busy removing covers and gust locks. Rod and Jeff went off to deal with the paperwork. Although the morning started fine the forecast for the day was not promising according to the Met Officer at RAF Leeming. The aircraft was refuelled and then it was time for some public relations activity. First Jeff entertained some local nursery school children before the Airplay team arrived. 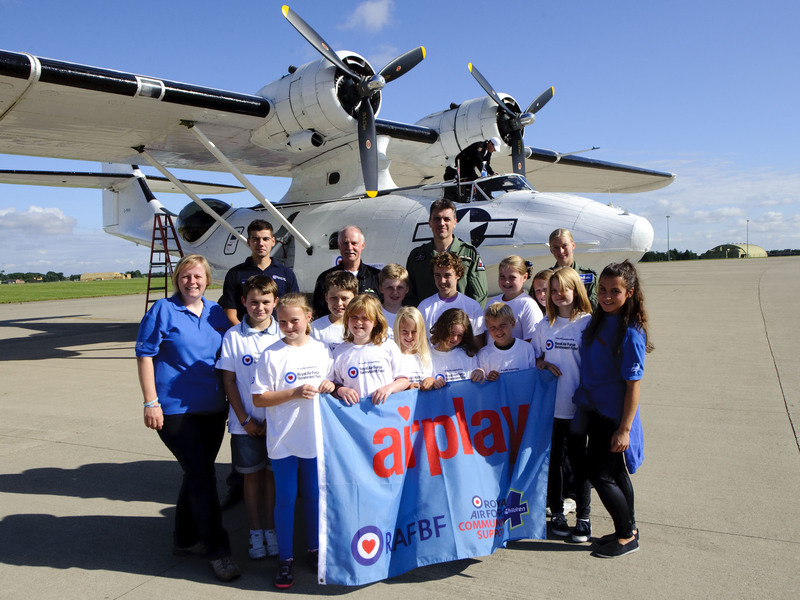 Airplay is part of the RAFBF activity for children on RAF Bases. Meanwhile Shaun ensured the cockpit glass was clean. Project Hawker Organiser and Co-Pilot Jeff Boyling thanks RAF Leeming Station Commander Group Captain Steve Reeves for his hospitality. Leaving RAF Leeming Group Captain Steve Reeves and Flt Lt Phoebe Rossiter were there to say farewell. With Jeff flying the Catalina departed on time and headed to the racecourse at Redcar before turning north. As previously mentioned the forecast was not great. An orbit at Seaham where Hawker had put down was abandoned due to low cloud. Beadnell was spotted through a gap in the cloud and an orbit was made. The further north the crew flew the worse the weather which was not something that had troubled the two Harry’s in their Sopwith Waterplane back in 1913. Heading further north, RAF Leuchars was covered in fog as was Montrose, the latter another place Hawker had landed at. By this stage the left PTT radio button had failed so Rod took over the flying while Jeff dealt with the radio and navigation issues. The Catalina is CAA certified for instrument flight and both pilots were suitably rated. Approaching Aberdeen the plan of flying a display over the sea just north of the harbour followed by a flypast at the airport was reviewed and abandoned. In 1913 the Control Point was the Palace Hotel and although no longer in existence the City Council had provided sponsorship and not to have done something would have been a great shame. Furthermore, Aberdeen is the home of the world’s only surviving WW2 VC holder (John Cruickshank, 210 Squadron Catalina 17-07-1944). ATC knew the score and came to the rescue by clearing the Catalina to 4000 feet and putting it in a wide downwind pattern while the busy North Sea helicopter traffic was dealt with. Cleared to the ILS the Catalina broke through at about 900 feet and Rod continued for a missed approach. During this, the coast became visible off to port which allowed a turn towards it and with great relief the air display was completed by Rod. Alas, given the weather no videos appear to exist of the display. Strangely, Jeff has never found any photographs of the two Harry’s and the Sopwith Waterplane visiting Aberdeen. It was then back into the murk for Jeff to follow the coastal routing north to Peterhead and Fraserburgh! Flying across the top of Aberdeenshire brought back thoughts of what it must have been like for the two Harry’s 100 hundred years ago. It would have been even more remote for them. Moving forward 30 years, thoughts also turned to Coastal Command as the Catalina passed Banff,a Strike Command base in WW2, on route to RAF Lossiemouth. The crew knew the airfield was there and re-assuringly for Jeff the runway became visual on base and the Catalina landed and taxied in to the welcoming party. A GR4 Tornado provides top cover for a 70 year old veteran, the Catalina G-PBYA. The local RAFBF team lead by Karen soon had a banner up and photos taken with the pilots. 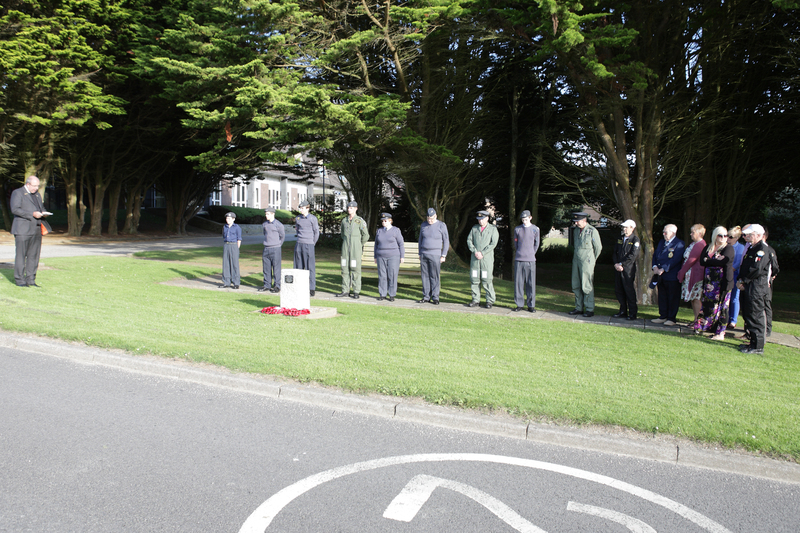 Later Jeff was busy with Group Captain Ian Gale laying a RAF wreath at the base memorial. This was done in memory of John Watts, a founding member of Plane Sailing Air Displays who was tragically killed in a random mid air collision of two Tornados. 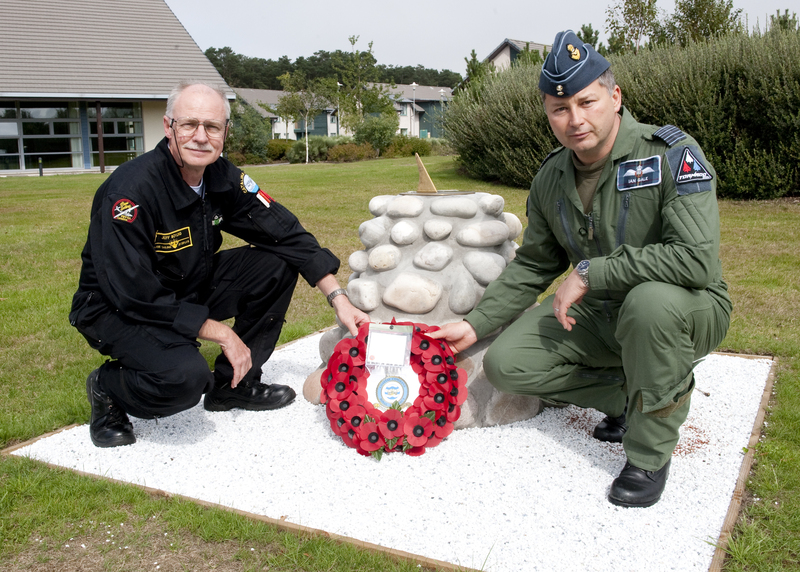 Wing Commander Ian Gale, RAF Lossiemouth Station Commander, with Jeff Boyling at the Base Memorial. It was soon time to say farewell and continue with the second sector of the day plus another display. Once again the RAF had been most welcoming and helpful. Day 1. Wednesday August 21st. Sector 2. 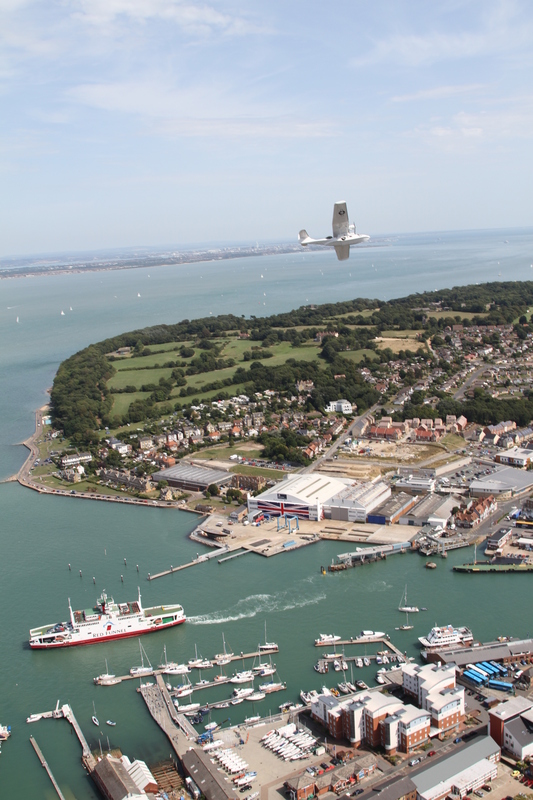 After refuelling the aircraft and the crew, the Catalina departed Southampton accompanied by a chase aircraft for some more air to air photography over Netley, Calshot, East Cowes and Portsmouth. Once again Jon Butts was flying this camera ship while Karl Drage was the man behind the lens. Netley on Southampton Water was the start point for the 1913 Circuit of Britain Race and nearby Calshot was a Naval Air Station. The Classic Boat Gallery in East Cowes was hosting a Sopwith Bat Boat Exhibition. Hawker had won the Mortimer Singer Prize flying one and it was the predecessor to the Sopwith Waterplane so an orbit over East Cowes was considered fitting for the ocassion. 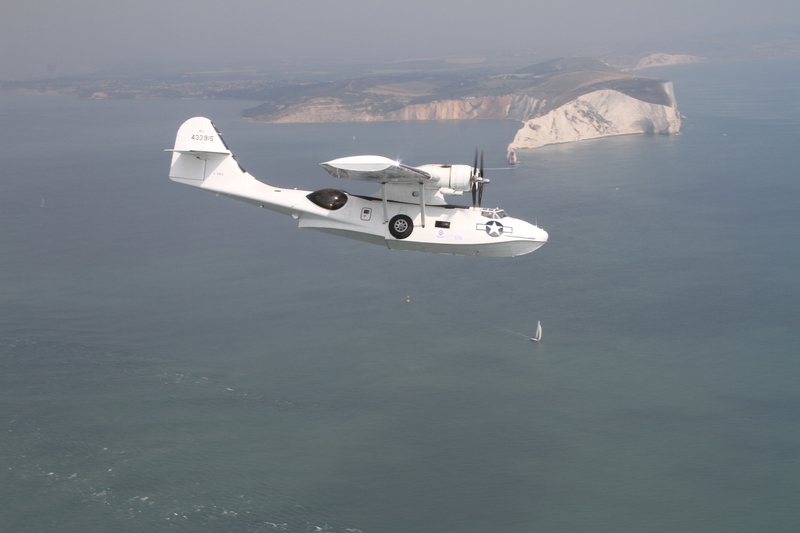 After Portsmouth the camera ship departed back to Lee-on-Solent and it was then down to work for the Catalina crew. By this stage Jeff was pilot flying and the first task was an orbit at Rustington on the south coast. Hawker had not set down here in 1913 but the RAFBF have a number of Sea Cottages there and an orbit was called for in support of this charity. Continuing east and having left Solent radars frequency the crew were speaking with Shoreham ATC. The Catalina is no stranger to Shoreham having visited previously for air displays on the south coast. Given the time there was bound to be a good crowd in the art deco terminal building enjoying the last of their lunch. 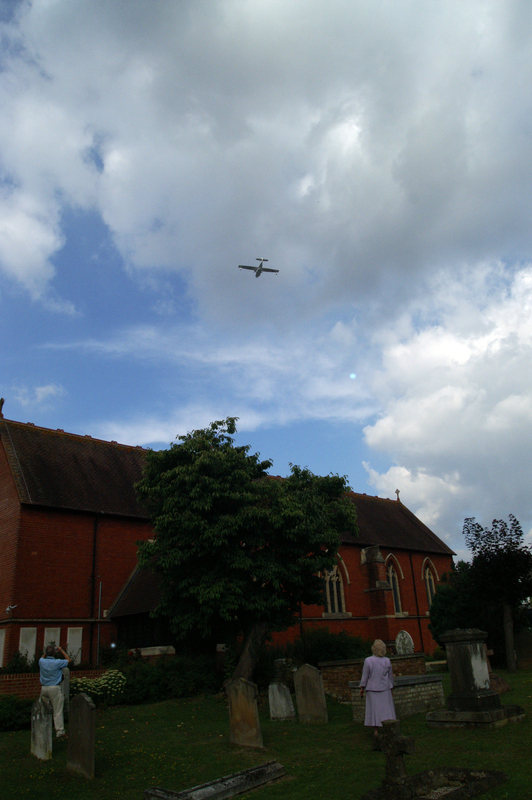 Shoreham ATC requested a flypast and the crew obliged with a missed approach. Continuing along the coast it was past Brighton Marina, Seaford and then Beachy Head. By this time Rod was on Lydd’s frequency. The danger areas around Lydd were avoided and the airfield circuit was not busy so Lydd had a close up of the Catalina with a flypast. Next waypoint was Ramsgate, the first Control Point for the Sopwith Waterplane in 1913. Jeff flew past with a running commentary to orientate Rod who then took over for the first display of the day. It was a short one as a few miles on it was repeated at Broadstairs for the benefit of the crowd at the water gala. Jeff was busy with Manston Approach and the display frequencies while monitoring height and speed as Rod put on a great display in a confined area. The next control point was Yarmouth, formerly a Naval Air Station, but that was an hours flight away. Before hand it was a case of negotiating a number of danger areas off Southend plus the wind farms not to mention the restricted area for Sizewell Nuclear Power Station. Jeff was back flying while Rod took over the radio duties. 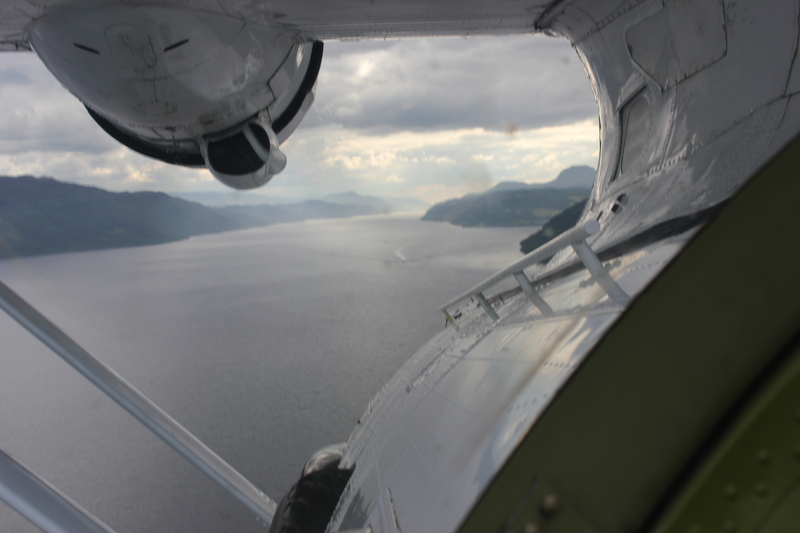 The crew flew at about 700 feet above the sea and kept as close to the shoreline as possible so that those on the ground had a chance to see the Catalina as it flew past. Just south of Yarmouth Jeff flew inland so as to approach the display area of the second Control Point from the north. This had the folk on the ground wondering as the YouTube clip shows but Rod brought the Cat down to display height and started the routine. 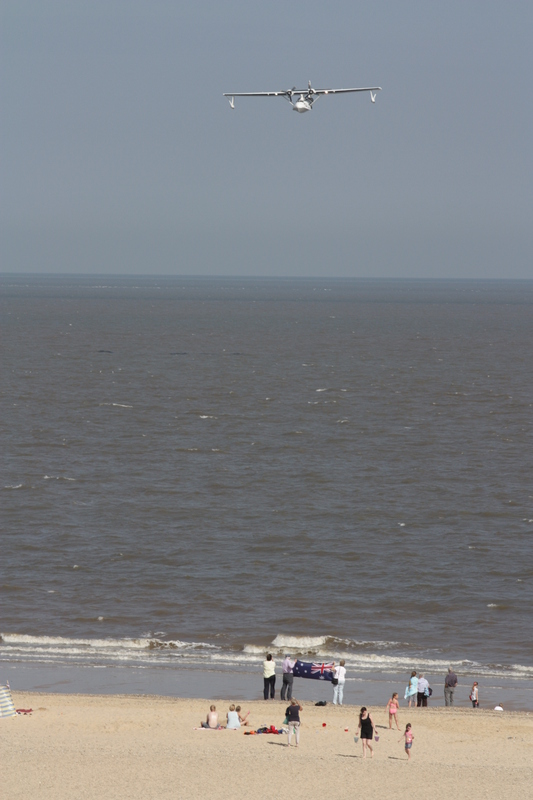 Seeing a Hawker relative waving an Aussie flag on the beach at Gorleston-on-Sea was a great sight to behold. Dianne Whitfield flies the flag for her distant relative, Harry Hawker. Leaving the display area the Catalina crew flew along the coast to the delight of the holiday folk on the Yarmouth esplanade and continued their journey north. All along the way the Catalina crew had been thinking of Harry Hawker and his mate Harry Kauper. They had no radio so one less task but were they lonely being out of contact and what did they see? Continuing north it was a case of avoiding some NOTAMed displays at Cromer, the windfarm off the coast at Skegness as well as the firing range at Donna Nook. Hawker had none of these to worry about. The Catalina’s two Pratt & Whitney R1830’s purred on but Hawker was dependent on his Green 100HP 6 cylinder in line engine. The final display of the day was at Scarborough but that was some way off. With all displays it is a case of how to make an entrance and what better way than from behind. Once again Rod showed the Catalina off to the crowd on the various Scarborough vantage points. Standing at the Castle, Graham Cook provided this wonderful shot of the Catalina starting a turn to starboard prior to running back in to the Grand Hotel, the 1913 Control Point still in existence. Jeff An unscheduled flypast at Durham Tees Valley was undertaken prior following a request from the tower. It was than a case of Jeff positioning the aircraft for a landing at RAF Leeming. The arrestor cables were not required and soon the Catalina was on the apron opposite the Met Office. After a long day it was great to see the welcome party of Station Commander Group Captain Steve Reeves and Flt Lt Phoebe Rossiter plus ground crew waiting. Although the primary aim of the flight was to commemorate the achievements of Harry Hawker and Harry Kauper 100 years ago there were other duties for the crew of this flight. While Rod completed the paperwork Jeff was welcoming Brad Brown (11 and in the yellow T-shirt) and his family on board. Brad, a young aviation enthusiast who has bravely fought against Acute Lymphoblastic Leukaemia over recent years, was given the opportunity to go on board the Catalina and meet the crew. The smiles on the faces says it all! With the assistance of the RAF ground crew, Crew Chief Shaun Jarvis soon secured the aircraft for its overnight stay. Later Jeff laid a wreath at the Station Memorial before Flt Lt Phoebe Rossiter took the crew to the Officers Mess to relax. Photo credit for the above two photographs RAF/MOD Crown Copyright 2013.